Splinter meditates upon his life, from the time that he was a young man named Yoshi learning the martial arts from his Uncle Gyogi, to his years at Osaka University studying history and philosophy, to his life as a member of the Foot Clan. Eventually Yoshi left the Foot to continue his religious studies in Tibet, where for one year he was taught by the Charlie Llama. At the end of World War Two, Yoshi returned home and witnessed the atomic bomb being dropped on Japan. He managed to escape death and later rejoined the Foot, where he was framed for murder by none other than Oroku Saki, who desired Yoshi’s position in the Clan. Yoshi was cast out of the Foot Clan and traveled to America, where he took up residence in the sewers of New York City. Soon, he discovered four turtles in a green ooze and cleaned them up. That night, Yoshi transformed into the mutant rat we know as Master Splinter. 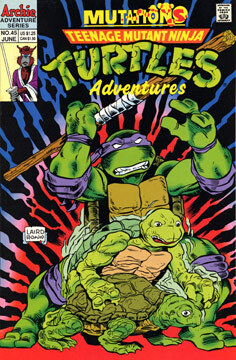 As you know, the turtles also mutated. Splinter decided that since they would be outcasts from society, he must teach the turtles how to survive, thus he became their sensei and taught them ninjitsu. Years later, Saki arrived in New York City with his branch of the Foot and began his criminal empire. Splinter decided that he and the Turtles must stop his old foe, and the battle was on. After contemplating his past, the Sensei investigates a noise in the sewer and discovers that his students and Ninjara have prepared a birthday celebration for him.